Sunday School classes move to Jones Building April 28! On Sunday, April 28, children’s Sunday school will move to the first floor of the Jones Building. Look for greeters and signs to help you find your way. 3rd‑5th: begins in the Choir Room (sanctuary building), then goes to Room 121. Building a foundation of Christian faith for children and families. Children's Ministry is abounding with opportunities for children fifth grade and under to be nurtured in their faith. From monthly fellowship gatherings, weekly Sunday School classes, and deepened involvement in worship services, to special events like Bible Workshops, intergenerational events at church and off-site retreats...there is no shortage of opportunity for you and your children to plug-in to the wonderful ways God is working at Idlewild. 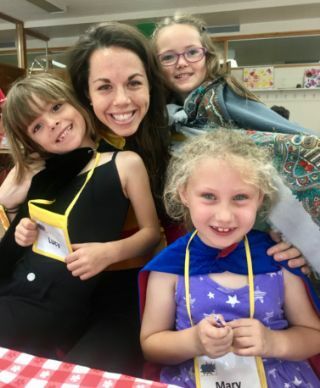 Children's Ministry Mission Statement: Believing in the importance of nurturing a growing relationship with Jesus Christ and God’s people, we will with God’s help, guide children to know, love, and serve the Lord by providing a solid foundation of Biblical understanding with opportunities to apply spiritual truths at home, school, and play. What ages does Children's Ministry include? What age children are in the nursery? What is Children's Church Continued? 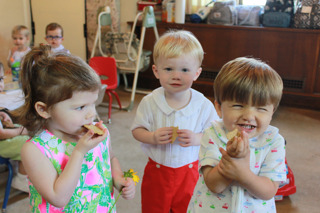 Can children participate in Communion? What leadership opportunities do you offer for children? How can I get involved? See FAQ for anwers to these questions and more, or contact Caitlin C. Bomar. The Nursery is open Sundays from 8:15 a.m. to 12:15 p.m. providing loving, nurturing care for the littlest members of our church family. The Nursery is located in the Sanctuary Building, (Former Conference Room, 1st Floor). The first time, you will need to fill out a registration form. 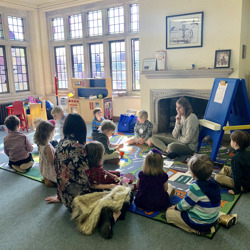 During the Sunday School hour from 9:40 to 10:40 a.m., this class explores simple Bible stories using Cokesbury's Deep Blue curriculum, with lots of time for active play. (No class in the summer, but care still available). August 19, 2018 - May 19, 2019 9:40 to 10:40 a.m.
August 5: Sunday School Teacher Orientation 12:30-2:00 p.m. in the Harlan Room. Please let Caitlin know if you would like to be a Sunday School teacher or shepherd for the 2018-2019 school year! 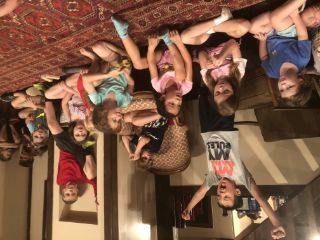 Children in grades 3-5 who are interested in being a part of a children's choir will have the opportunity to meet at a scheduled weekday time as arranged by Barry Oliver, Director of Music Ministries. Idlewild welcomes children of all ages and encourages them to participate in our entire worship service. Children’s worship packets can be found at all entrances to the church Sanctuary. 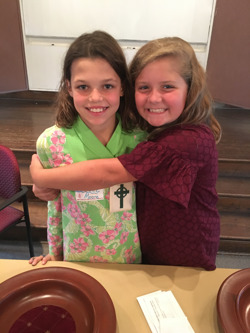 First Sunday Bulletin Greeters: Children in SK through 5th grade are given the opportunity every first Sunday of the month to help pass out bulletins by the entrances to the Sanctuary. 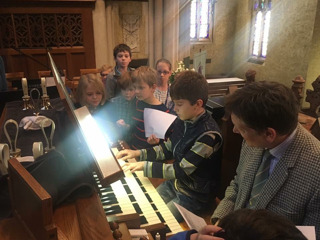 Third Sunday Ushering: Children in 3rd through 5th grade are invited to serve as ushers in the 11 a.m. service every third Sunday, while children in SK-5th grade are invited to serve as ushers in the 8:30am service every third Sunday. Lord’s Prayer: Children who have memorized the Lord’s Prayer have the opportunity to sign up to lead the congregation in the Lord’s Prayer to close the Time with the Younger Church. Children of all ages are invited up front for the Time with the Younger Church during the 11 o'clock service. Children that are in senior kindergarten and older return to their pews after the Time with the Younger Church, while children in pre-kindergarten and junior kindergarten (typically three and four-year-olds) are invited to come to Children's Church Continued (C3) in the former library. In C3, children enjoy a time of structured biblical teaching and a Christ-centered craft, followed by snack and free time. 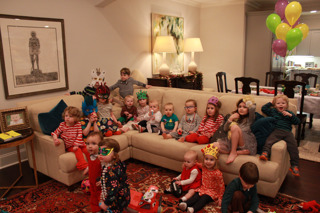 Children two years old or younger may go to the nursery located in the former Conference Room. 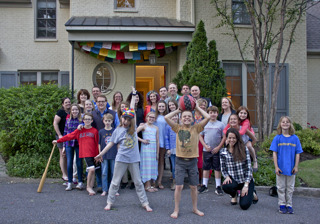 Fellowship gatherings are held regularly for both JK and under families, and SK-5th grade families. There is no agenda for these gatherings other than to enjoy each other's company and grow in community through the challenge and joy of raising children. If you would like to host, please contact Caitlin Bomar, cbomar@idlewildchurch.org. FEB 23: Hosted by Elizabeth and Jim Gilless, 1731 Glenwood Place, 38104, 5:00-6:30 p.m.
APR 13: Church-Wide "Day in the Park" at Shelby Farms, 10:00 a.m.-3:00p.m. MAY 11: Hosted by Kathy and Justin Lohman, 16 St. Andrews Fwy, 38111, 5:00-6:30 p.m.
JAN 19: Hosted by Brad and Susannah Dillard, 3515 Autumn Ave, 38122, from 5:00-7:00 p.m.
FEB 17: Hosted by Amy and Josh Poag, 218 Tuckahoe Ln, 38117, 5:00-7:00 p.m.
APR 13: Church-Wide "Day in the Park" at Shelby Farms, 10:00 a.m.-3:00 p.m.
MAY 4: Hosted by Karen and John Matthews, 647 S. McLean Blvd, 38104, 5:00-7:30 p.m.
FEB 1: Parents Night Out from 5:30-8:30 p.m. for children PK-5th grade(childcare available for nursery-aged children). Come for a fun night of fellowship as we learn about the importance of showing hospitality to others. Bring your own dinner. FEB 17: Stewards of Children Sunday School Teacher Training HAS BEEN CANCELLED. MAR 1: Created by God Gathering for 5th and 6th Graders and Parents from 5:30-8:30 p.m. This is an event held in an effort to provide a safe space for conversation around the topic of sexuality to take place in a shame-free environment. Cost is $15 per family for curriculum and pizza dinner. MAR 24: 2nd Grade Bible Presentation during 11:00 worship service. Followed by Lunch and "Getting to Know Your Bible" Workshop for 2nd graaders and parents from 12:15-1:45 p.m. Strock Room. APR 13: Day in the Park at Shelby Farms from 10:00 a.m. - 3:00 p.m. This will begin with an Easter Egg Hunt for 4 year old and under children! MAY 19: End-of-School Year Party for children in PK-5th grade Sunday School classes from 9:40-10:40 a.m. in the new Sunday School classrooms located in the Jones Building!